No Dad! This is my big pointy stick! You can't have it! You can't have it! Yipe. I keep hearing "Team America: World Police" in my head now! Any quote from that would probably be perfect.
" I'm so ronrey! So ronrey..."
And look: lots of friends to play with. One of them brought a bat, another's got cookies, that one 4th from left is gonna score. Looks like they're gonna have fun! This is the real Spear of Destiny, right, pop? Kim Sr: What?....oh! Suuure. You'll do just great. 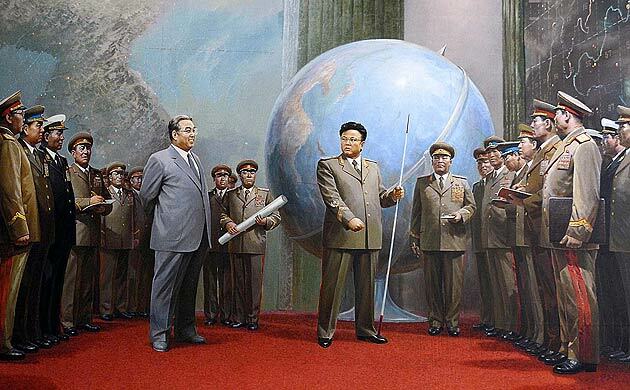 Y'know, if you were to Photoshop a leash running from Kim II's hand to his dad's neck, it would be hysterical. Alas, I'm posting from a computer with alll the capicity of Etch a Sketch. Kim JR: But I don't want to share a dictatorship power with the rest of these knuckle-heads dad! I want to be in charge, ME and ME ALONE! Kim JR: Let's get real, hell no! Is it just me or is Korea the only land mass on that globe? No there's the edge of China and you can see Japan and Taiwan. Do they even MAKE globes that big? It looks very 1950s! Jr. "Well Dad, what we do today? Sr. Same as everyday son, Try to take over the world! Kim Jr: "Honored father! Am I to understand that ambassador Clinton is to be admitted entrance to the war room?" Kim Sr: "That is precisely the idea, son, that is precisely the idea." Kim Jr: "But he'll see everything, he'll...*points stick*...he'll see the big board!"